NEW YORK - Jan. 18, 2019 - PRLog -- The 7th Annual NYC Re-tails & Sales Pet Expo is back for more pet industry fun! This year for the first time, the boutique B2B tradeshow will be offering special show hours for animal lovers in the Tri-state area. 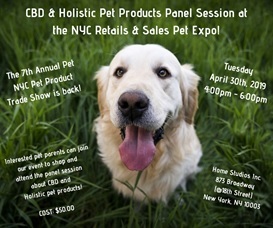 On Tuesday, April 30th, during the last two hours of the show, from 4pm – 6pm, pet parents are invited to this one-of-a-kind expo to shop for new and innovative pet products, as well as attend an informative panel session about CBD and Holistic pet products. The event will be held at Home Studios Inc. near Union Square Park (@ 18th Street). Tickets are available for the special pet parent hours (4pm - 6pm) for the first 50 people that register to attend. What: Each year, pet industry professionals in the New York City and surrounding areas anticipate the NYC Retails & Sales Pet Expo; a one-of-a-kind boutique B2B tradeshow. It's a great opportunity for participants to network and establish connections in a fun, laid-back but business focused atmosphere. Hosted once again by Nancy Hassel of American Pet Professionals and Dana Humphrey of Whitegate PR, the upcoming show will feature plenty of new products for 2019. In previous years, the NYC Retails & Sales Pet Expo was exclusive to Media, Pet Retailers, Groomers, Veterinarians, Social Media and Pet Influencers; however, this year for the first time, the event will be opening their doors to the public for special pet parent hours. From 4pm – 6pm, pet parents are welcome to attend the expo to shop for the latest and greatest pet products, as well partake in a very interesting panel discussion regarding one of the pet industry's fastest-growing trends: CBD and holistic care. There's no doubt that pet owners today are in search of a more natural and holistic approach when it comes to caring for their pets. Plus, utilizing alternative remedies such as cannabidiol (CBD) products is on the rise due to the various health benefits they provide to both human and pets alike. Pet parents must pre-register in order to attend April 30th's show during the special hours. The first 50 people to register will have the unique opportunity to mix and mingle with other animal enthusiasts, shop for new products on the market and learn more about two hot topics from industry experts during the CBD and Holistic pet products panel session! Well behaved, leashed (6-foot leashes, no retractable leashes) or pets in strollers welcomed.